As we’ve seen over the past few days, Paris has more than its fair share of palatial buildings, leafy boulevards, and grand public squares. But there is a quainter side to this beautiful city too; pockets of the Medieval town remain, where the streets are narrower and the atmosphere more charming than magnificent. 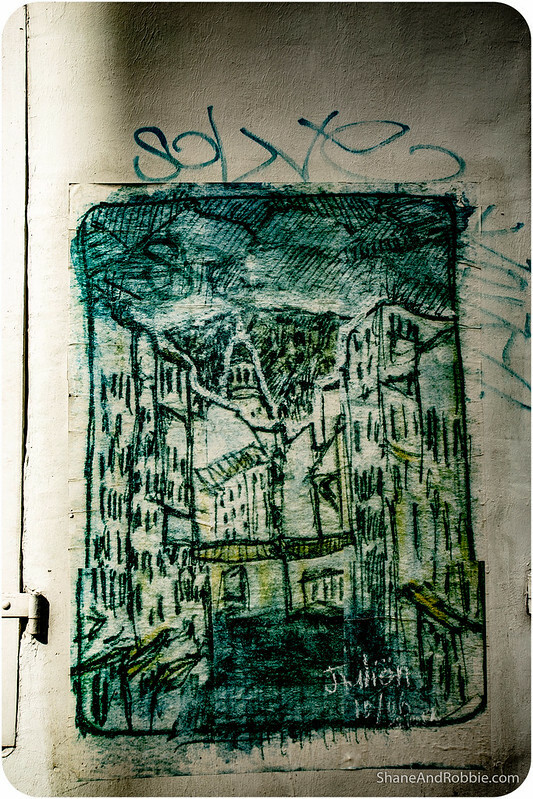 Montmartre is one of these areas. 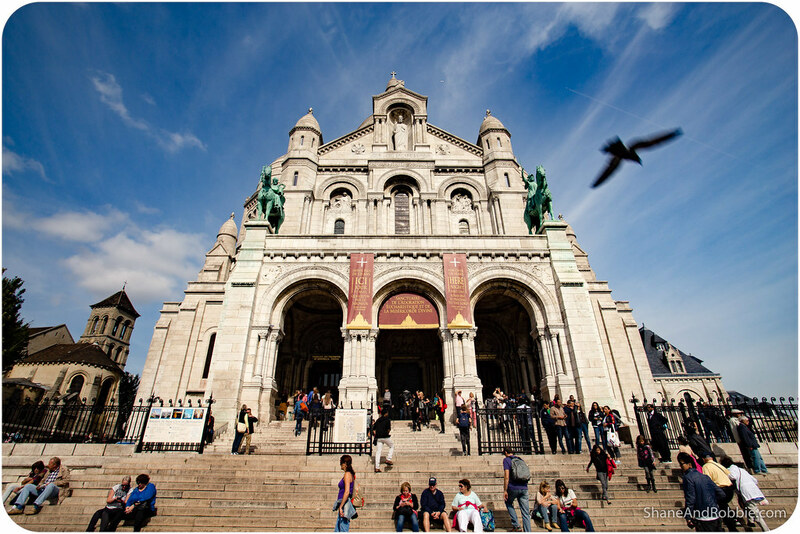 We got the best views of Paris from the steps in front of Montmartre’s famous church: Sacre Coeur. This shining white cathedral dates back to the late 19th century and is quite beautiful in its own right, both inside and out (no photos allowed inside). 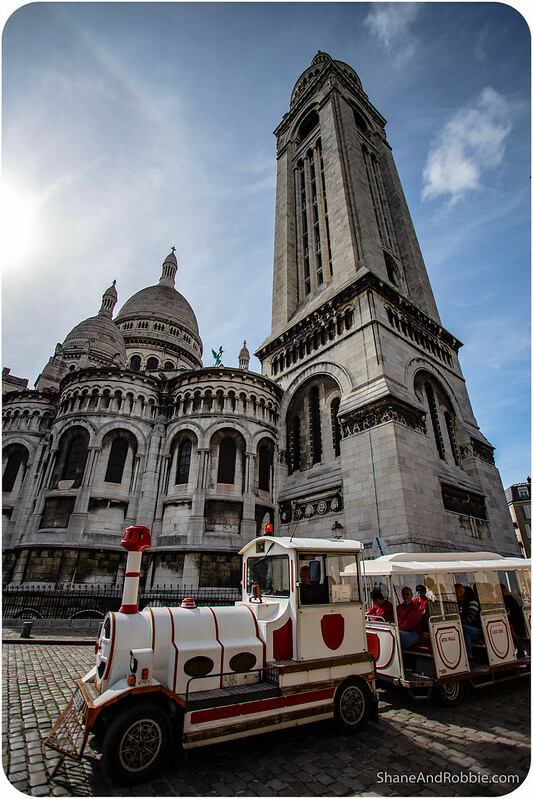 The tourist hordes that congregate here and the accompanying circus that follows the crowds is less appealing, however, so we didn’t linger around Sacre Coeur and instead made our way into Montmartre proper. 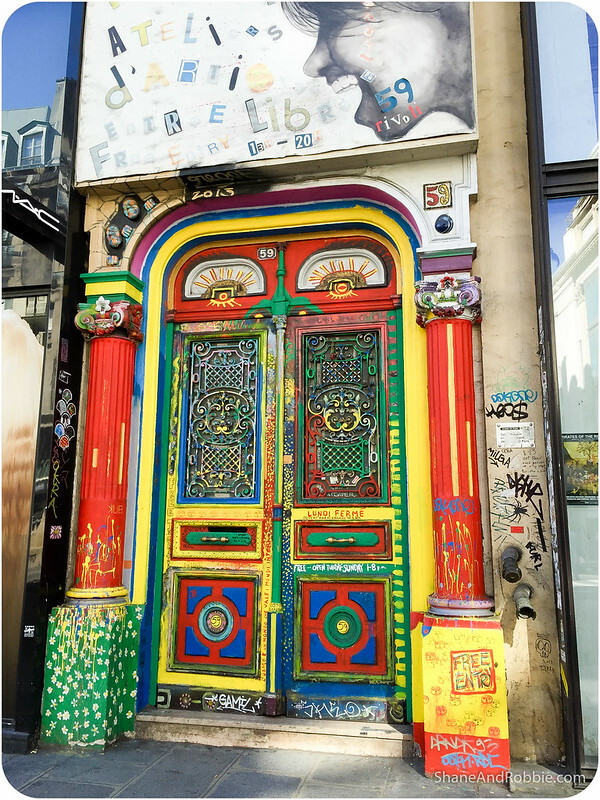 This modern-day enclave of art studios, boutique shops, bars, nightclubs, and wealthy residences was once a quiet village outside of Paris proper. 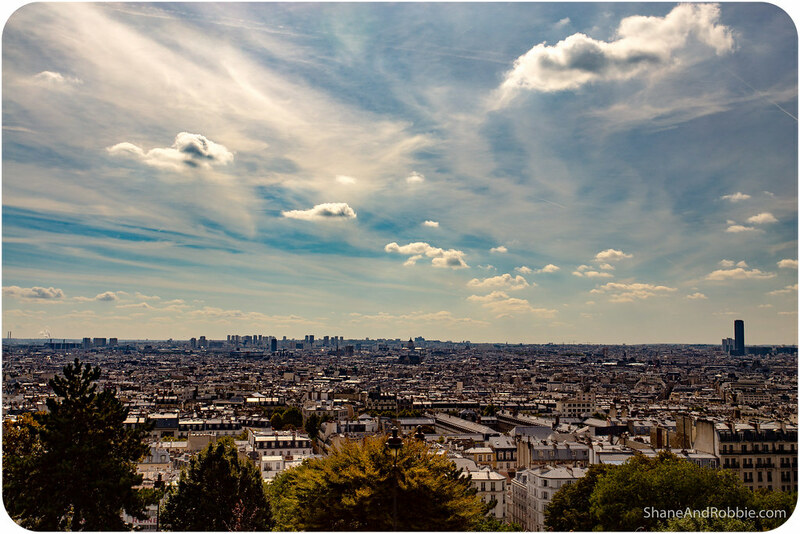 It only became part of the French capital in 1860, engulfed by the growing city as it expanded. 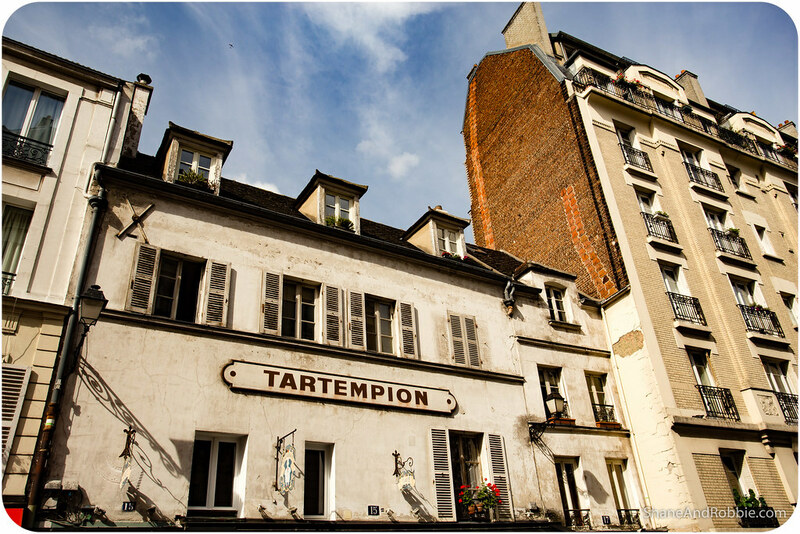 During the Belle Époque, from 1872 to 1914, many painters, singers, songwriters, dancers, poets, writers, musicians, and artists moved to Montmartre. 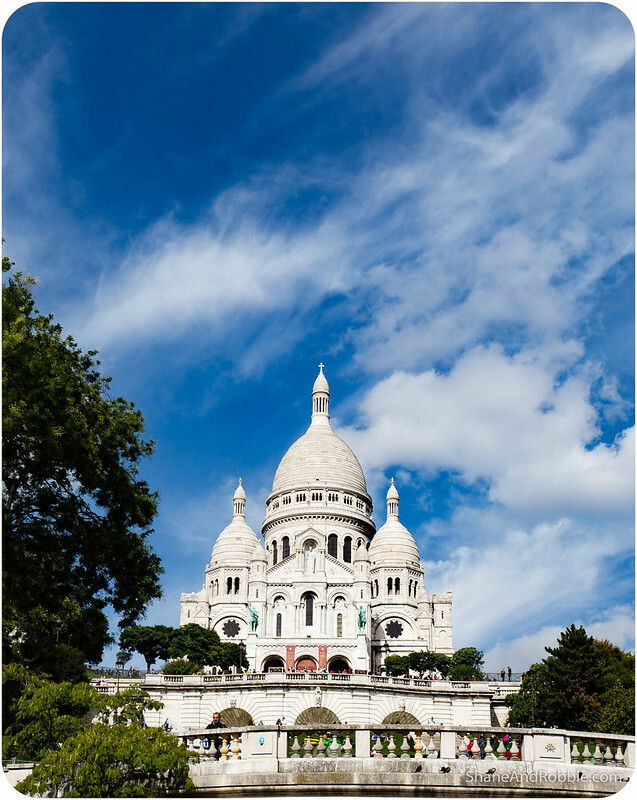 Attracted to the area by its low rents and avant-garde atmosphere, free spirits of all sorts made Montmartre their home, thus shaping the area’s unique Bohemian character. 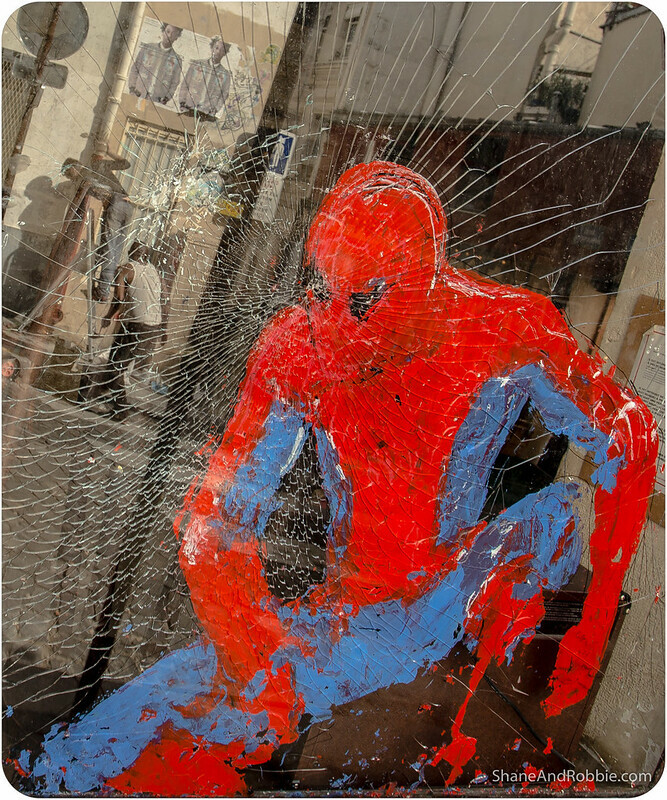 Most famously the district was home to artists such as Salvador Dalí, Amedeo Modigliani, Claude Monet, Piet Mondrian, Pablo Picasso, and Vincent van Gogh. 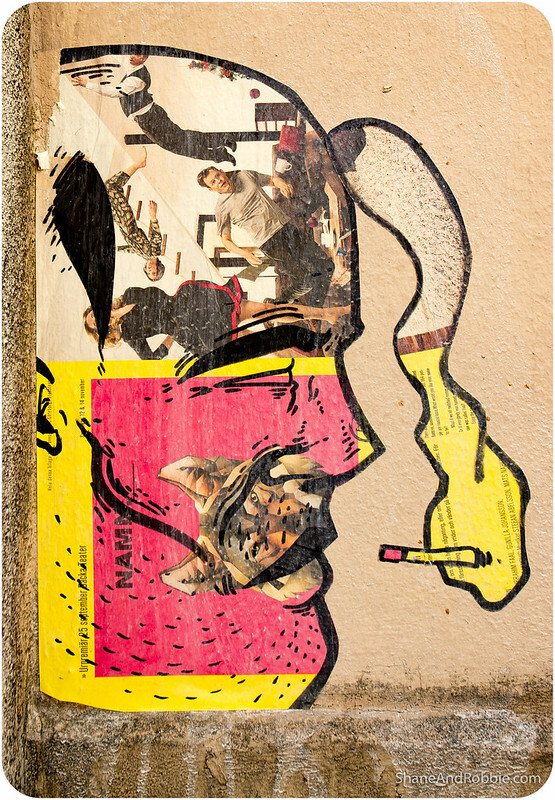 Art studios, galleries, nightclubs, and bars opened up, and the area gained a reputation, not only as an artistic enclave, but also a nightlife hotspot. 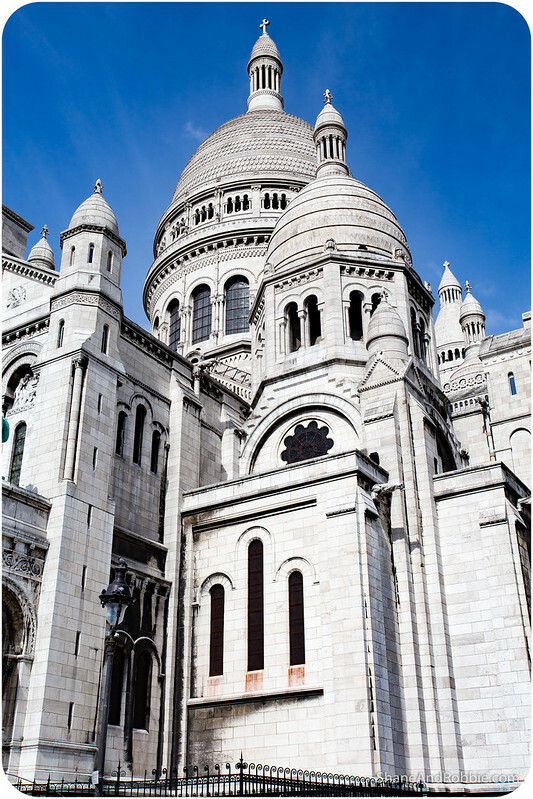 Montmartre became synonymous with drinking, dancing, and debauchery. 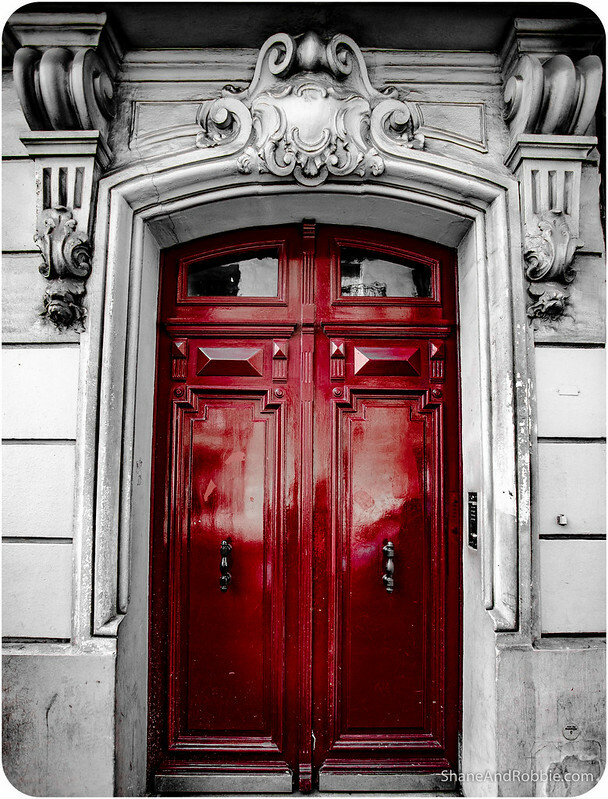 To this day the area remains Paris’s entertainment hub and includes the city’s Red Light District, though by day it’s more touristy than tawdry. 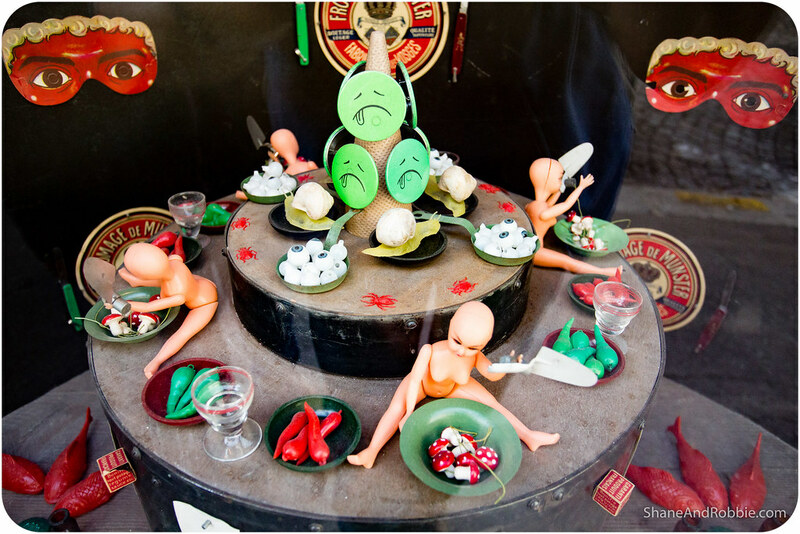 Some of the cabaret clubs opened here in the 1800s became famous and, in fact, are still targeting visitors today. 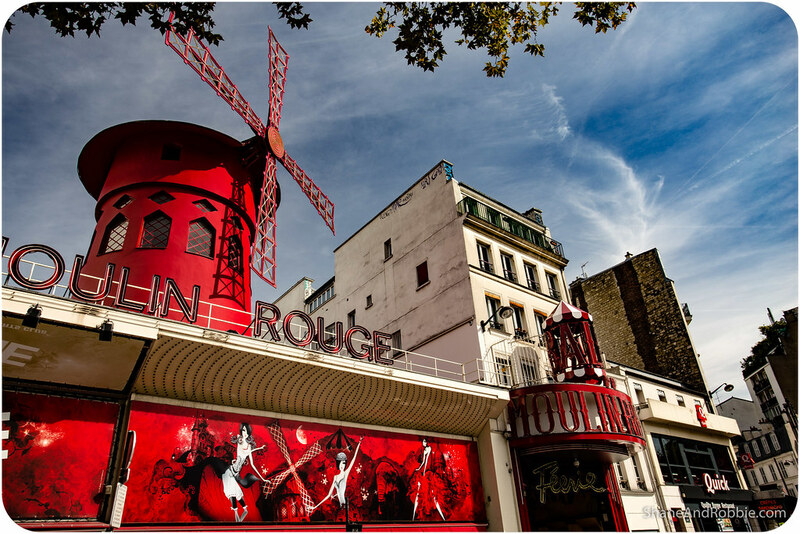 The Moulin Rouge, for example, is a cabaret bar best known as the spiritual birthplace of the can-can dance. Originally introduced as a seductive dance performed by the courtesans who operated from the site, the can-can dance evolved into a dance that is now seen in musicals and cabaret shows world-wide. Today, the Moulin Rouge is still a cabaret bar where tourists pay their €165 per head to have dinner and watch performers dance the modern, less risqué version of the can-can. The original Moulin Rouge (i.e. red windmill) was one of many in Montmartre; it was originally used to produce flour back when the area was just a village. 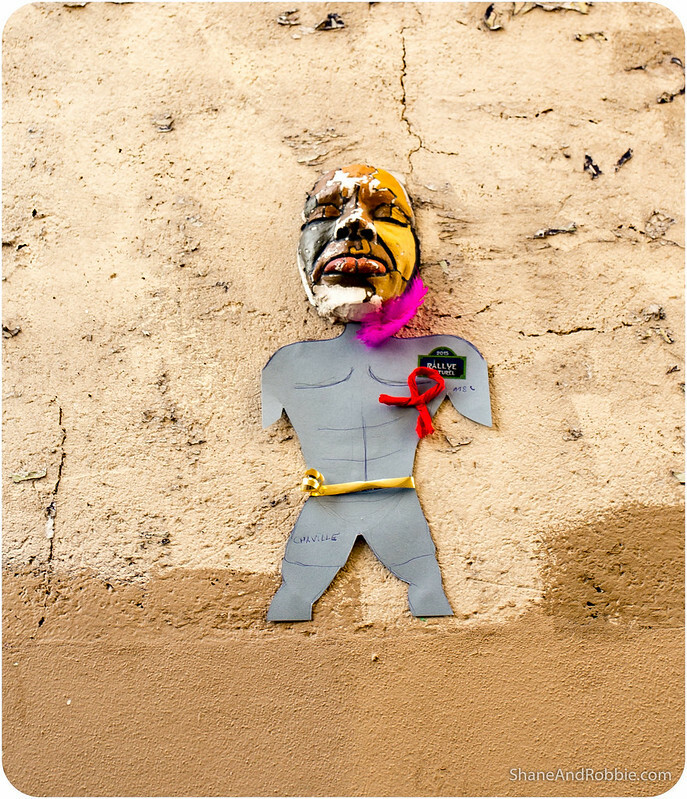 Artists gathered at the windmills for bread and a glass of wine on the terrace overlooking Paris, and later the owners added dance halls and cabarets to keep them entertained – and spending money. 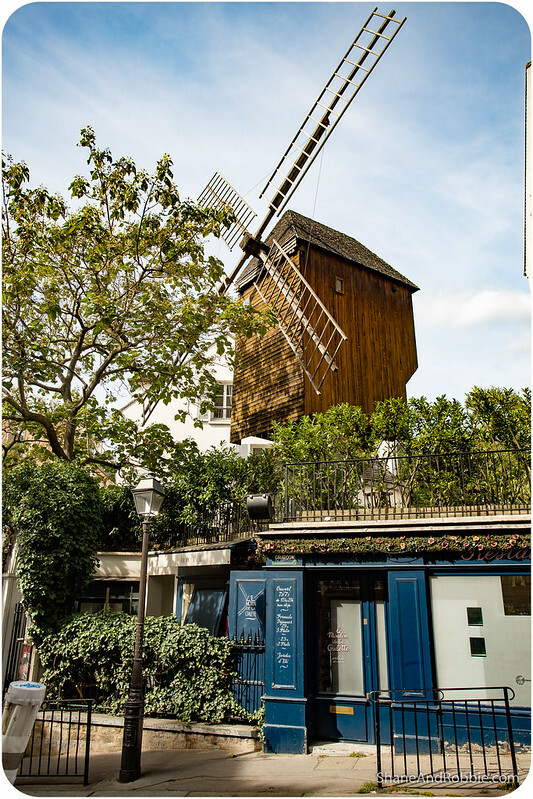 Other windmills that got converted into clubs this way include the Moulin Arafat and Moulin La Galette. 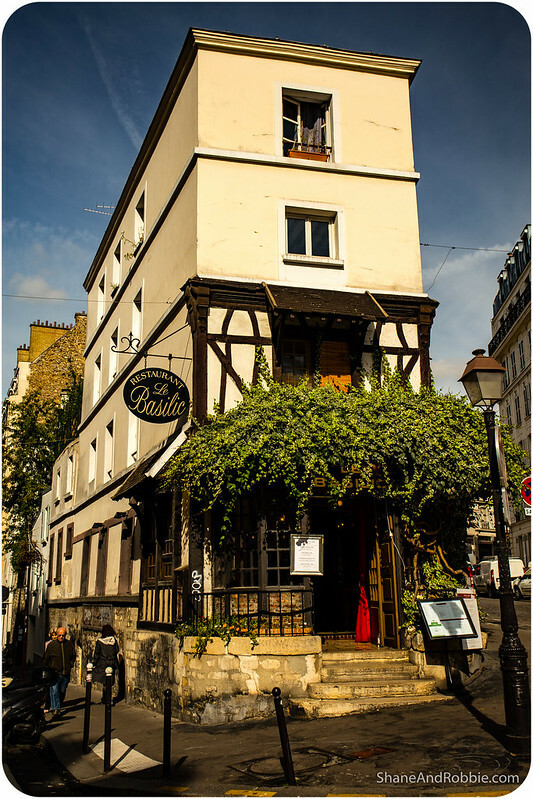 Le Moulin de la Galette was known for its popular balls of the mid-19th century. Parisians came here to admire French cancan dancers and to dance themselves. Renoir immortalised this ball in the painting Le Moulin de la Galette. 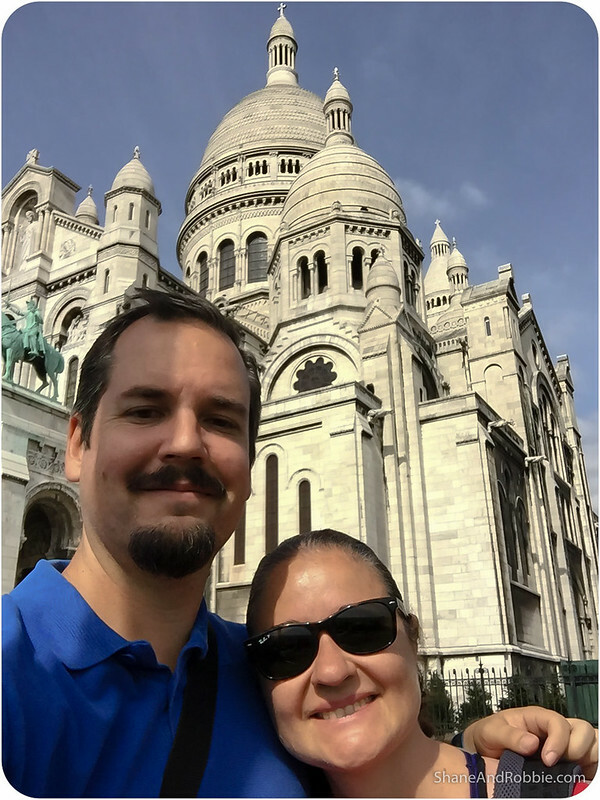 After 2 days of marvelling at Paris’s big sights, it was nice to wander the narrow, cobbled lanes of Montmartre and soak in some of its atmosphere. 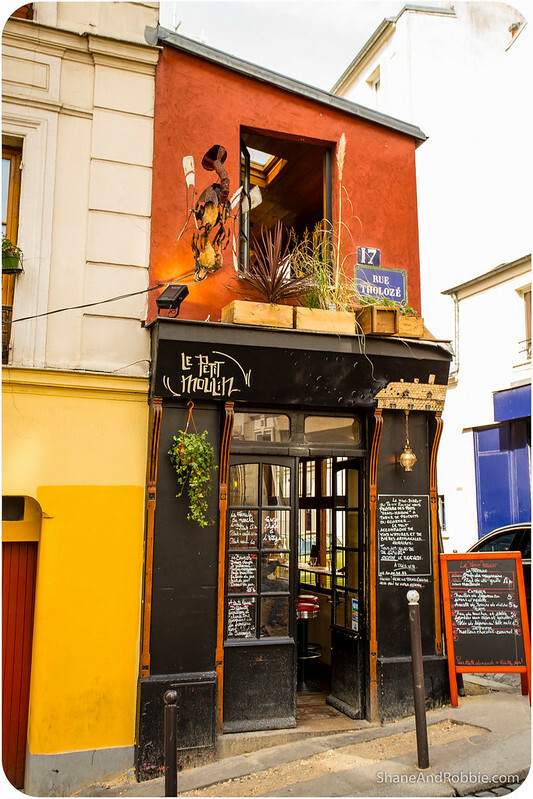 It may not be as edgy, artsy, and Bohemian as it once was, but there’s still a creative side to Montmartre than we loved. 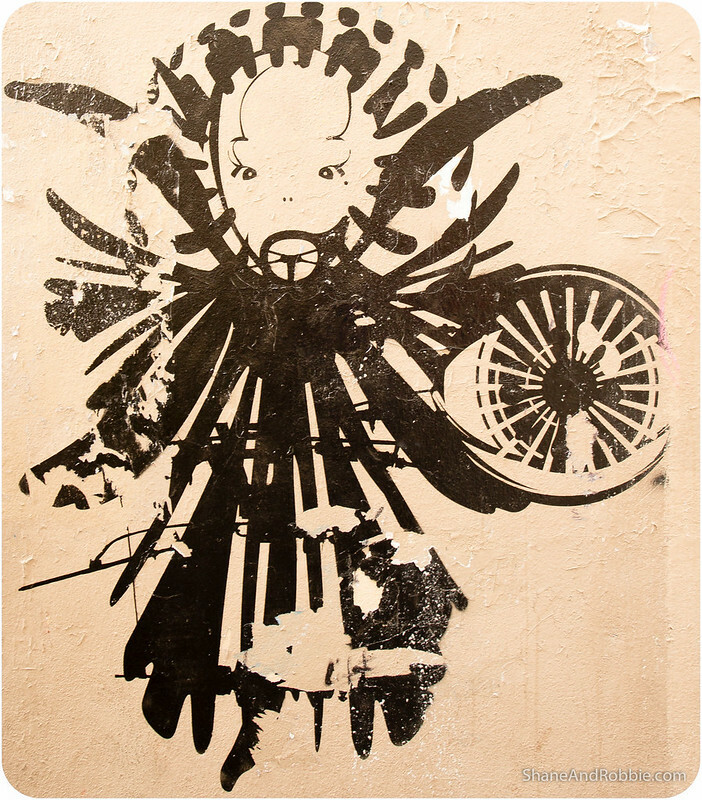 It’s there in the way the shop fronts are decorated; in the random pieces of artwork we found in tucked away corners; and in the creative graffiti. 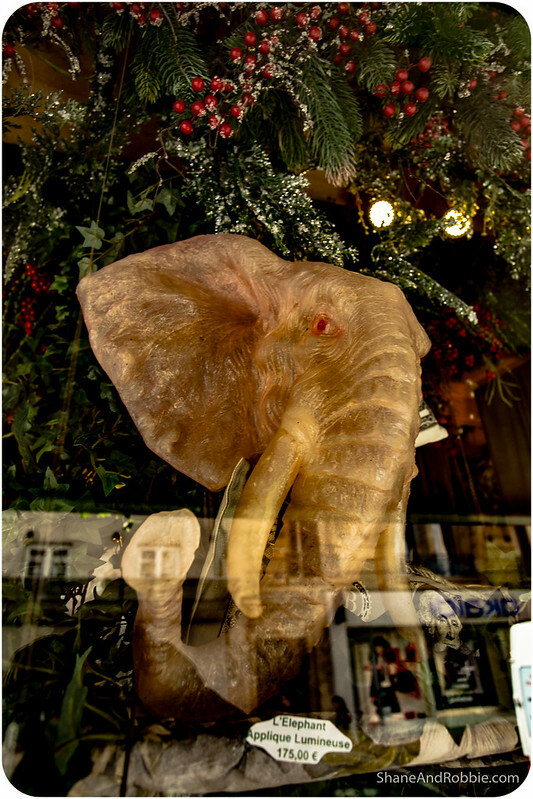 Every time we turned another corner we were rewarded we with some new piece of quirky artistry. 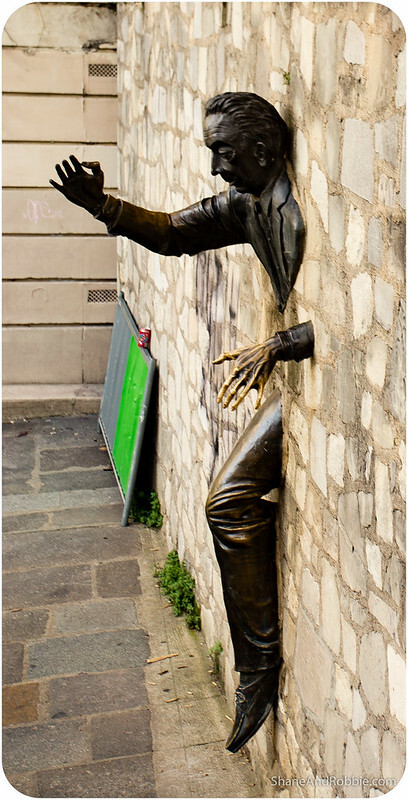 One of our favourite finds of the day was the famous Le Passe-Muraille (i.e The Walker through Walls), a larger than life bronze statue representing a man half trapped in a wall. 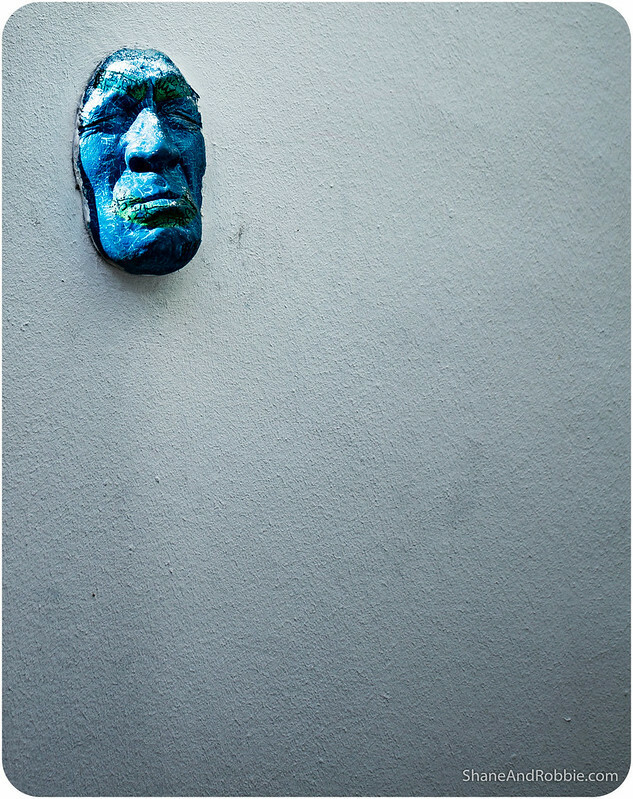 The French sculptor Jean Marais created this unusual bronze patina sculpture in 1989 to pay tribute to Marcel Aymé, a popular French novelist, screenwriter and playwright. 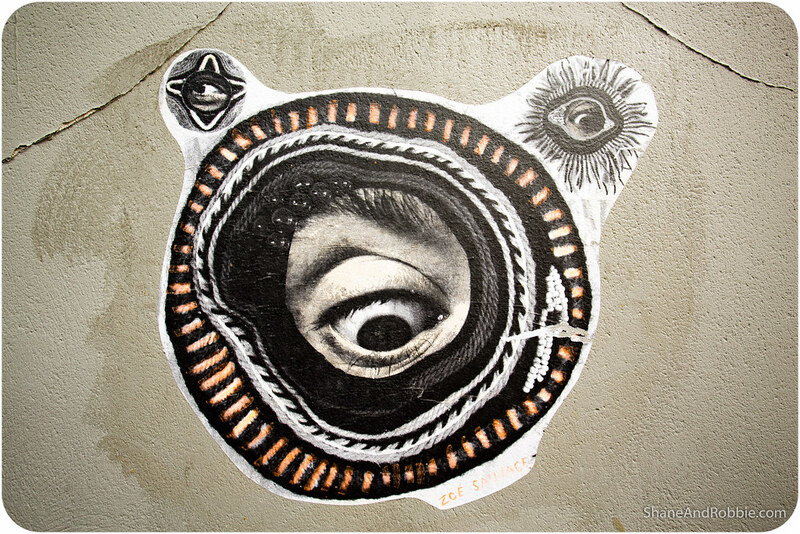 We had a great morning exploring Montmartre’s streets, looking out for random pieces of street art and enjoying the peace and quiet. 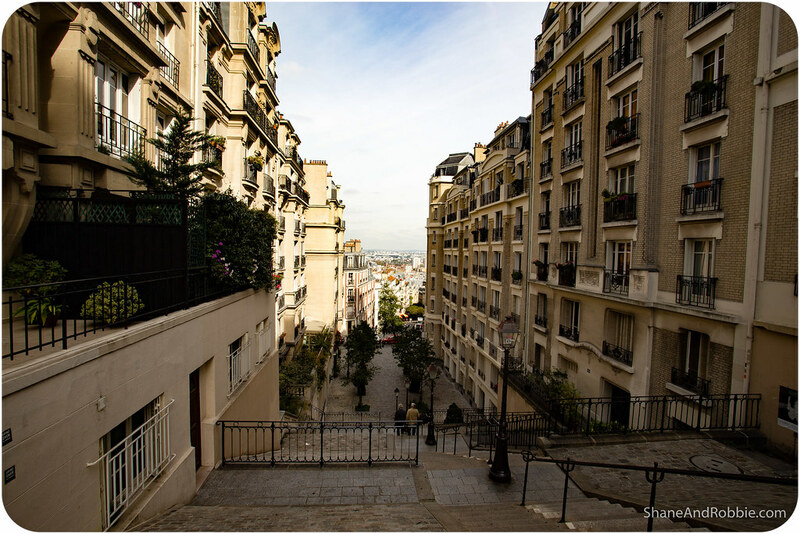 Away from the main touristy strip and the Basilica de Sacre Coeur, the neighbourhood was remarkably serene. 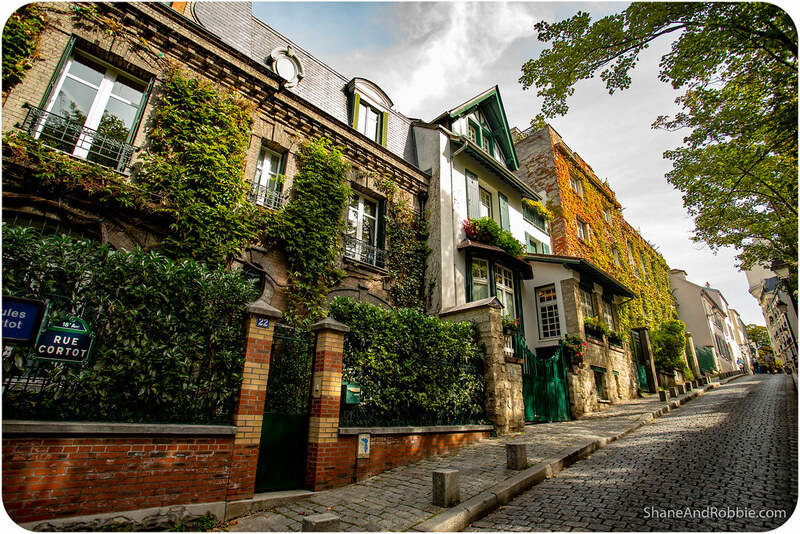 Strolling around the streets of Montmartre was a real pleasure, and the views across Paris were stunning. 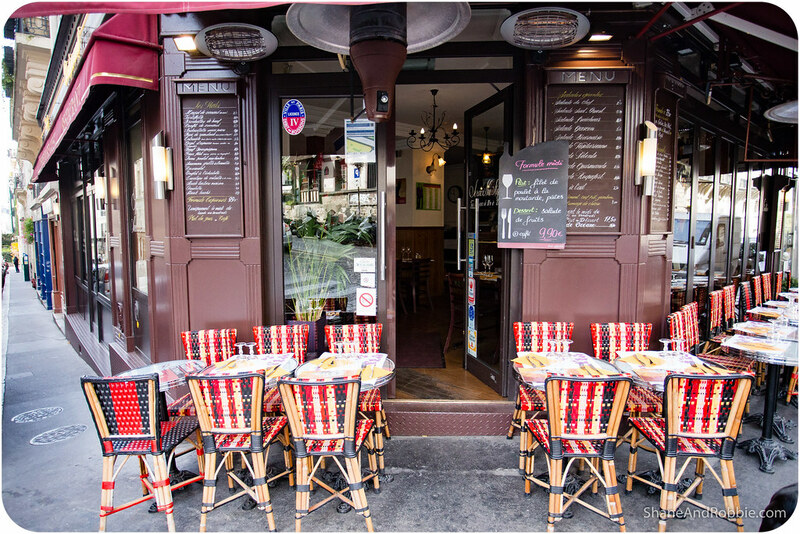 We stopped for lunch in a typically Parisian café before continuing on to our final stop for the day: the Montmartre Cemetery. 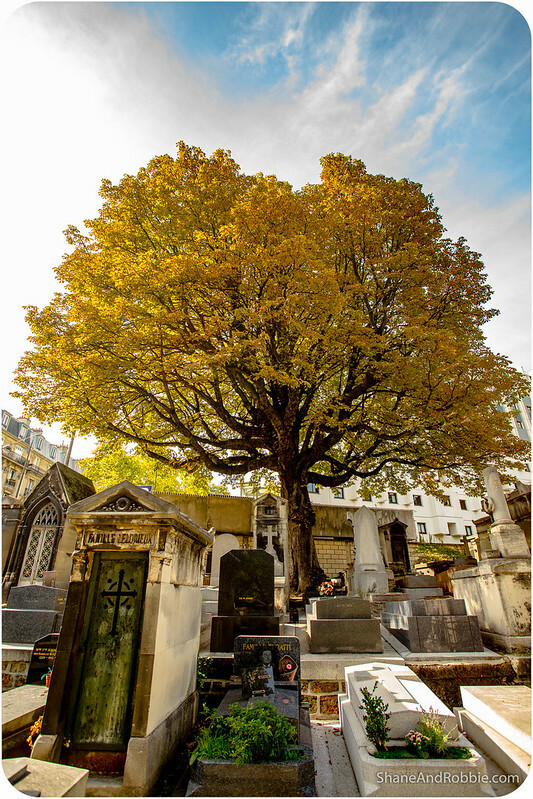 The Montmartre Cemetery was opened on January 1, 1825. 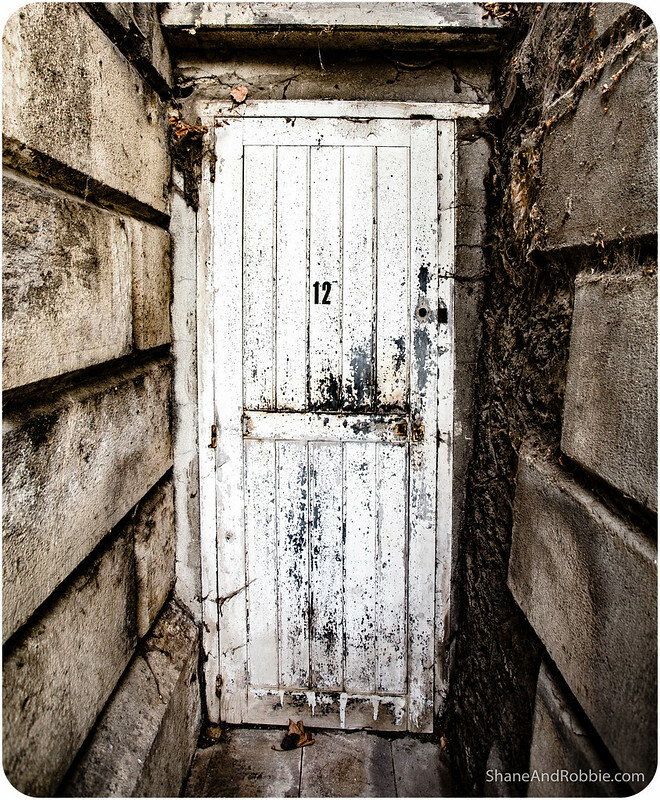 It was built below street level, in the hollow of an abandoned gypsum quarry as part of a city-wide campaign to improve sanitary conditions. 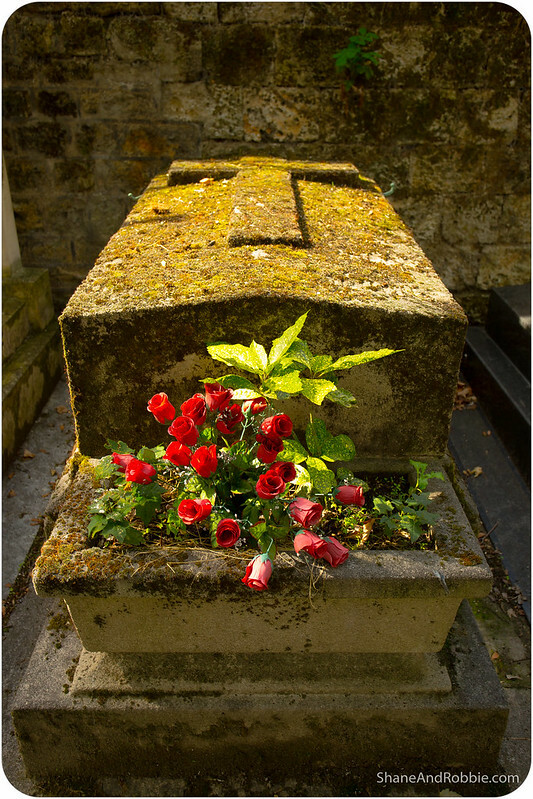 Because, you see, in the mid-18th century, overcrowding in the cemeteries of Paris had created numerous problems, from impossibly high funeral costs to unsanitary living conditions in the surrounding neighbourhoods. 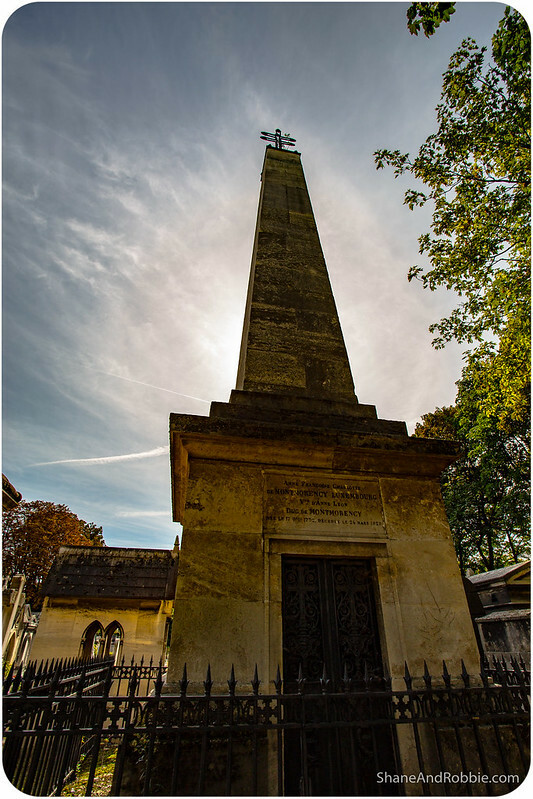 In response the Cimetière des Innocents was officially closed and citizens were banned from burying corpses within the city limits of Paris. 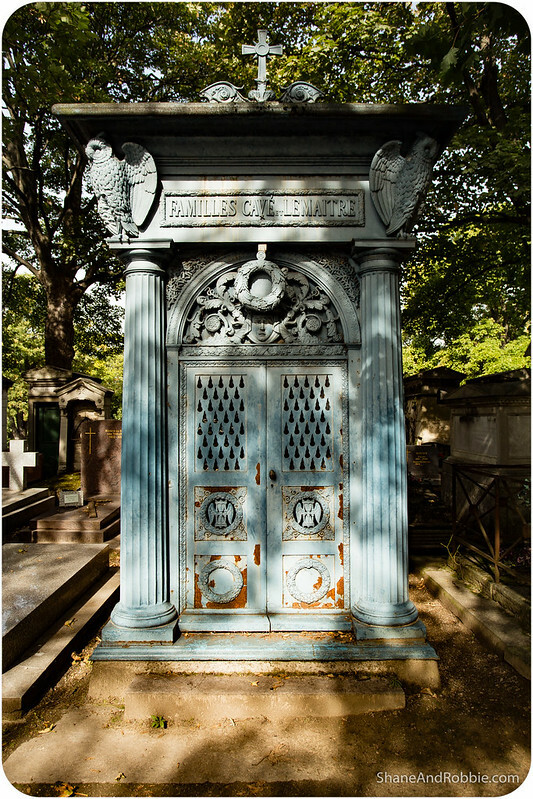 During the early 19th century, new cemeteries were constructed outside the precincts of the capital: Montmartre in the north, Père Lachaise Cemetery in the east, Passy Cemetery in the west and Montparnasse Cemetery in the south. 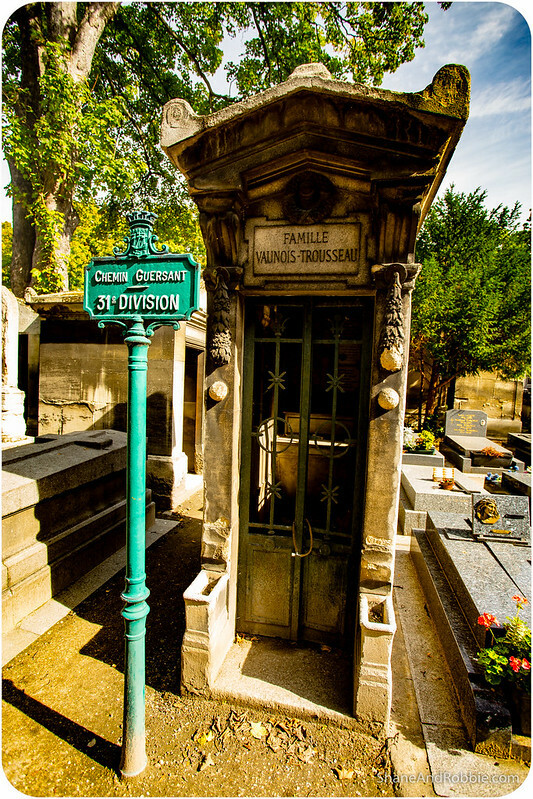 Today Montmartre Cemetery is the final resting place of many famous artists who lived and worked in the Montmartre area. 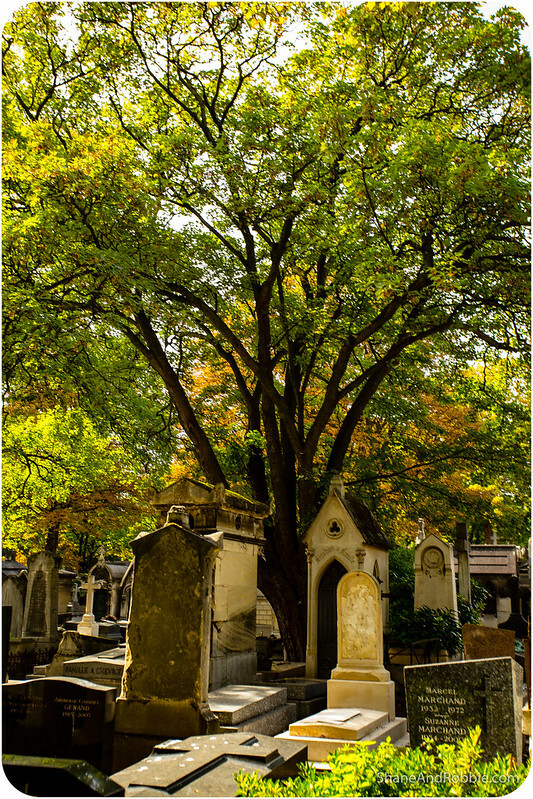 Many people visit the cemetery to see these graves; for us it was more about enjoying the atmosphere and taking quiet pleasure in the autumn colours around us. 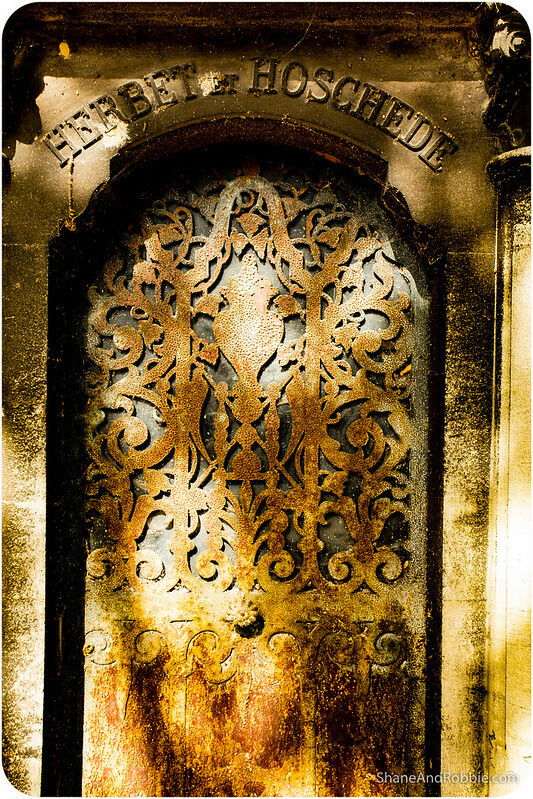 We’ve been to a few cemeteries in our travels around the world and they tend to be beautiful places, perfect for moments of peaceful reflection. 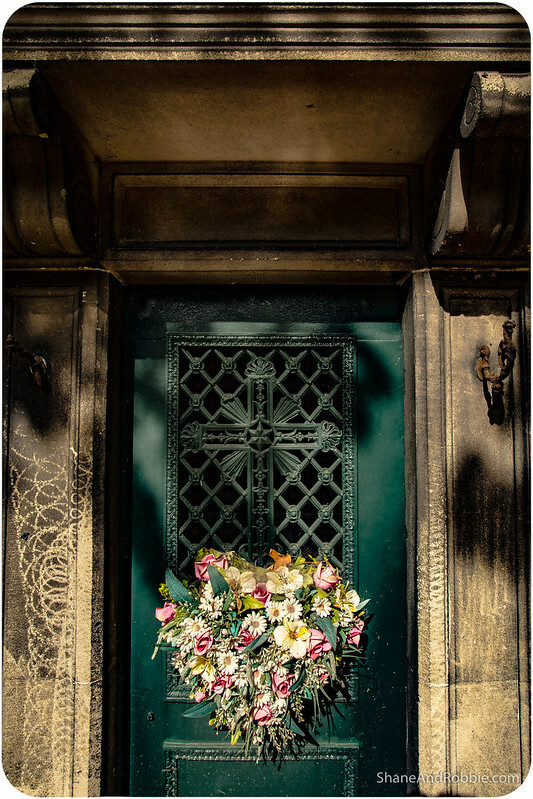 Cimetière de Montmartre was no different. 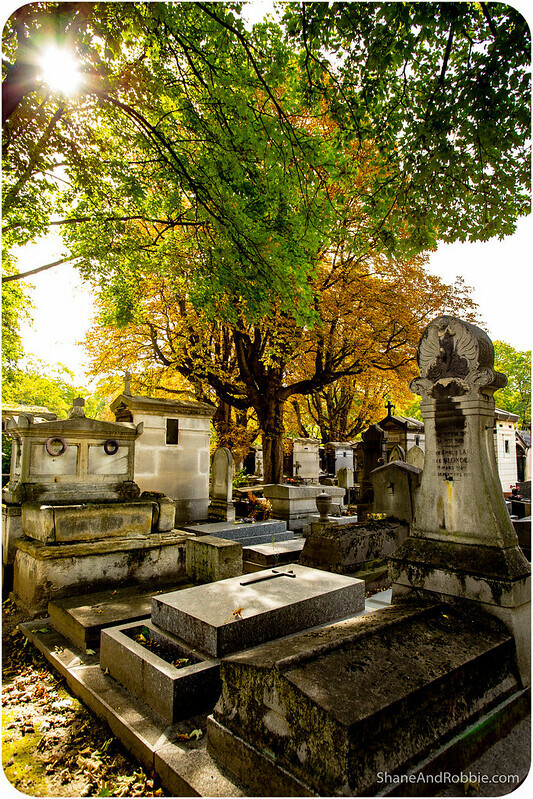 After a comfortable hour or so wandering through the Cemetery of Montmartre we headed back down the hill and caught the bus back across town to Montparnasse and our Parisian home-away-from-home. Tonight is our last night here in Paris and, though we haven’t seen everything there is to see in this town, we’ve had a great time here and can’t wait to return. À bientôt Paris! 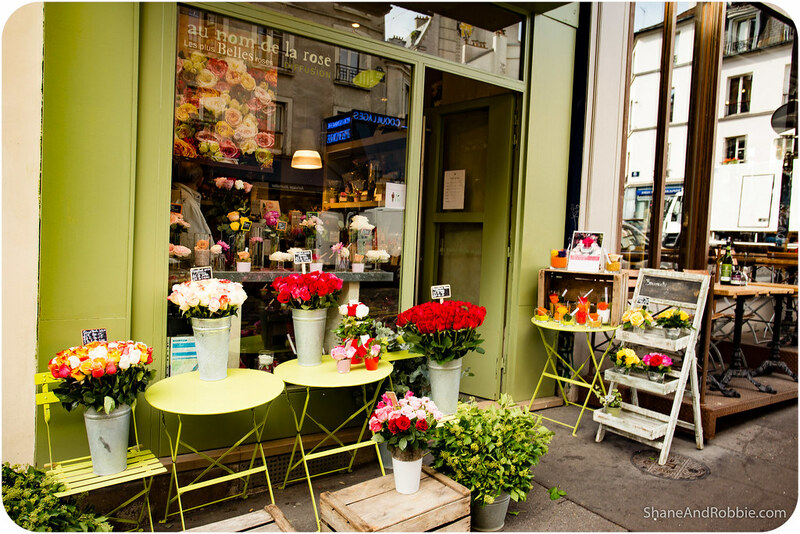 Gorgeous photography – you make the magic of Paris come to life! Glad you’re enjoying the blog – we’re sure having fun making it! 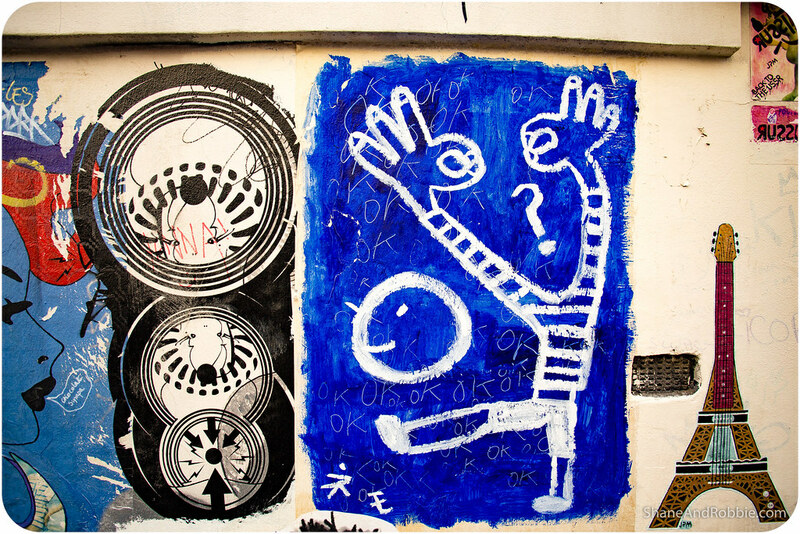 There was no point for us to try for epic photos of the usual big sites, as it’s all been done so thoroughly and professionally – so we went looking for angles, little things on the streets, and some quieter corners that made for a more memorable trip (less touristy, really). What do you use for editing photos? I want to work on making my photos stand out. All our photos are managed through lightroom, plus the google nik plugin collection for the occasional something special; we shoot in raw and usually just sharpen the images, pull out a bit more colour on dreary days, turn a few sepia/black and white, and whack a border on so they have nice curved edges for the blog.